Those who work in the theatre love theatre. At some point this love was ignited, working in the school theatre or in a temporary job. Whether stagehand or prop master, whether metal worker, carpenter, painter, decorator or constructor, whether sound or video technician, almost all of them had non-theatrical training and a different career goal, yet as soon as they sniffed the theatre air they were hooked. The technical director at the large and financially well-endowed Schauspiel Stuttgart, Luise Weidner, performed only silent roles in theatre at her school, but she wanted categorically to be part of a theatre troupe. At university she studied Theatre and Event Technology parallel to mechanical engineering. After a job at the Renaissancetheater in Berlin, her path was clear. Today she distributes the budget, minimizes hazard potential on the stage and develops technical riders – a list of technical requirements in which all maintenance groups register their equipment for the frequent guest performances. Her work consists in numerous details but is about the big picture, about maintaining and improving the quality of the Stuttgart theatre: “How do we want to go where and what do we absolutely need to maintain our quality, our standard? And what would be necessary to improve our standard and the opportunities that we can offer?" More people work behind the scenes than in the spotlight. The cost for a performance is enormous. The technical director in Stuttgart supervises 109 employees, in six groups – carpentry, welding, painting, sound and video, decoration and lighting. Karl-Heinz Krämer, technical director of the small and financially limited Württemberg Landesbühne Esslingen was trained as a carpenter and read social studies at university. He got hooked on the theatre after working in a temporary job at the Cologne Opera, became technical director in Heidelberg, at the Deutsches Theater in Berlin, in Potsdam, at the Bavarian State Opera in Munich and, as fresh as ever, in Esslingen. Theatre air is addictive. Technicians are an essential part of theatre productions and they have a clear opinion about them. But they must do what the stage designer or the director orders. Karl-Heinz Krämer: “I see myself as a service provider for the artist”. In this he speaks for all his colleagues. “Theatre is theatre is theatre”, says Krämer: “It smells the same everywhere – in the prop department as on the stage”. Whether at the Bavarian State Opera, where the budget for a stage set can sometimes come to Euro 200,000, or in Esslingen with a meagre Euro 9,000. The challenges remain – they are only different. A regional stage like Esslingen, for example, is obliged to travel and perform all over Baden-Württemberg. This means that technicians must build two stage sets, one for the stage in Esslingen and one that can be transported and fit into Künzelsau civic centre. Safety and order is the primary responsibility of stage inspector Stephan Abeck, chief stagehand in Stuttgart and supervisor of 45 people. The trained metal workers, carpenters and decorators not only set up and take down the sets every evening; a foreman is also always present at rehearsals. The key work process lies between construction of the first mock-ups, when the drawings, design and preferably the finished model are discussed, and the technical inspection of the finished stage set about two weeks before the premiere. Particularly difficult is the relation between the effort required and the time allowed: “With all the time in the world, you can build anything”, but the stagehands have only three hours for dismantling the morning rehearsal and setting up the evening performance. Philipp Unger has been head of props in Stuttgart for six years; he and 13 other prop men are responsible for putting dinner on the table for twelve people in the production of Terry Letts’s August: Osage County and for the plastic glasses looking like crystal. For the rose in The Snow Queen blooming, withering and blooming again – a very difficult thing to get right, but an ideal challenge for Unger, whose hobby is model making: “A prop man has to be able to tinker”. For chairs collapsing at the right time and for the 1,500 nettles that are plucked in every performance and thrown into the understage being planted again the next day in full their glory in the stage floor, as in the production of Hamlet at the Salzburg Festival. Directors like Martin Kušej, Volker Lösch, Armin Petras, who demand a great deal, are his favourites; his team too thinks the more difficult the task is, the better. The trained carpenter and restorer, who actually wanted to work in a museum, has also taken a state-certified examination as prop master. In his team everyone is a specialist: carpenter, decorator, tailor, upholsterer. The head of the sound and video department of the Staatsschauspiel Stuttgart is a multiple specialist. Frank Bürger plays three instruments, is a certified teacher of saxophone and clarinet, and was a sound engineer for orchestra and chamber music recordings before he was bitten by the theatre bug. After the first day of an internship at the Theater Heilbronn, he had to take over the outfitting of a play. Soon he was head of the whole department. Bürger has now been in Stuttgart for ten seasons. And although sound requirements are becoming more and more ambitious, the stage opener, music more and more played live on, next to or in front of the stage, the most rapid development in the last decade has taken place in video technology. For Bürger, his five sound engineers and five video technicians, this means constant continuing training so as to be at the cutting-edge and prepared for everything: “Many things in theatre are special solutions, one of a kind, custom-made for a specific performance. This is the most exciting aspect. You have to come up with a lot of ideas, implement the ideas of the artists as they imagine them and develop ways of doing this”. For example, to beam a video onto a twelve times twelve metre wall in Kaltes Herz (i.e. Cold Heart). This is not a simple feat to accomplish from the audience; additional beamers in the portal bridge are needed for support. These, however, must not be visible to the viewers. The effect is magical. Making things possible is their profession. They are responsible for the smooth functioning of the complex machinery of theatre and for this remaining invisible to the audience. For a production of the Hermannsschlacht (i.e., Battle of the Teutoburg Forest) in Potsdam, the paint shop clad the small “tin can”, the interim theatre in Potsdam, a proscenium theatre without a revolving stage, up to the ceiling in trees. In the first part of the play, the set designer wanted the audience’s view directed on the Teutoburg Forest; in the second part, on the hilly landscape. The specially constructed grandstand in the middle of the theatre nonetheless revolved. These are the sort of impossibilities that Karl-Heinz Krämer likes to try his hand at, applying lots of imagination. “Turn, turn – hey presto”, wrote unbelievers on the bleachers. 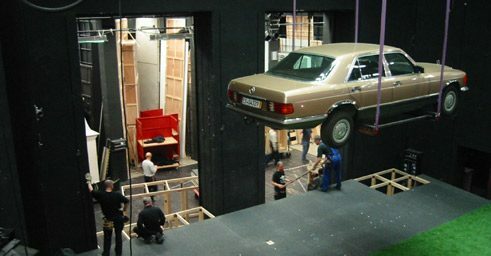 The theatre revolves, whether with the aid of 20 inexpensive car jacks acquired on the Internet and ten strong stagehands, as in Potsdam, or of an expensive and complicated rotary carriage, as in Stuttgart. More always works. With people as with machines. As in the wildly acclaimed Stuttgart performance of the Johnny Cash Songbook. The prop manager sang and played the flute, the porter strummed the guitar, the lighting master strummed the electric guitar and sang bass, the carpenter played the bass guitar and also sang. Ulrike Kahle-Steinweh Ulrike Kahle-Steinweh is a freelance film writer and works for various broadcasters, including SWR, NDR and BR. She is also a freelance theatre critic for “Theater heute” and “Der Tagesspiegel”. From 1999 to 2001 and from 2011 to 2013 she was a jury member of the Berlin Theatre Meeting.